The Flashing Tilefish, Hoplolatilus chlupatyi, or Chameleon Sand Tilefish has the spectacular ability to rapidly flash bright colors when stressed or frightened. The normal coloration of these fish is blue with a green dorsal ridge and a yellow stripe through each large eye. This delicate species is collected in deep water (30 meters or more) in the Philippines. Because of the difficulties of diving and collecting in deep water, Flashing Tilefish command a higher price and often suffer from improper handling and decompression issues. When purchasing new Flashing Tilefish it is imperative to obtain specimens that are healthy and eating very well. The fish should be eating frozen mysis, brine shrimp, and other small meaty foods with gusto, but if it only picks at food, pass on it. Flashing Tilefish are susceptible to Ich and parasites, but are also very sensitive to copper medications. Quarantining new tilefish can prevent disease and condition the fish without the stress of a busy reef tank. Flashing Tilefish are sensitive to bright lighting, so be sure to acclimate the fish slowly to the lighting in a well-lit reef tank. Flashing Tilefish are highly social and form monogamous pairs. Having a pair or group of tilefish can help them adjust to aquarium life and prepared food much more easily. Some hobbyists report that Flashing Tilefish use color changes to communicate with one another. Flashing Tilefish are very shy and may hide constantly when added to a new aquarium until they become familiar and comfortable with their new home. Once a Flashing Tilefish adjusts to captive life, it will not change color anymore. If your Flashing Tilefish changes color, try to discover any stressors or aggressive tank mates that may be bothering it and remove them. Flashing Tilefish are also very sensitive to changes in water quality. A healthy Flashing Tilefish may hide part of the day, but should be active and swim often, especially during feeding times. The fast metabolism and high activity of these fish requires them to be fed at least twice daily. Flashing Tilefish need a lot of swimming room and require an uncrowded aquarium of at least 55 gallons (ideally 100+ gallons) with a deep sand bed for the fish to dive into when startled. 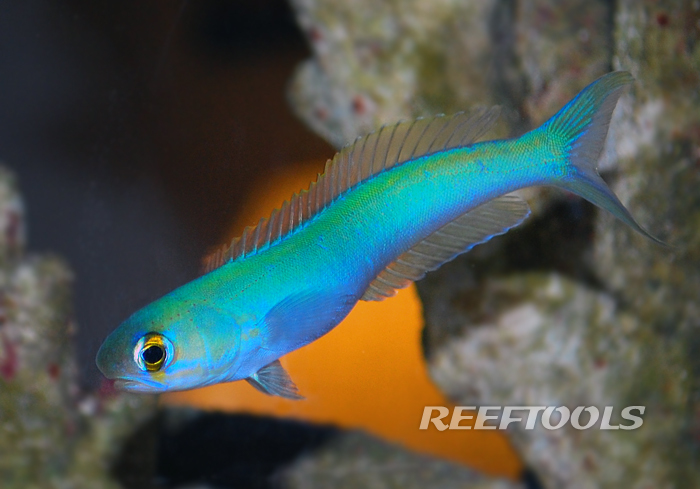 Most captive tilefish die from starvation, stress, poor handling, or jump from the aquarium. All but the most well covered aquariums can be a risk. Even a well adjusted tilefish may actively search for an escape, jumping out of the aquarium to its death.